Let me tell you few things that nobody told me and nobody will tell you. Being a British citizen, I took IELTS like a piece of cake. My first attempt was a huge eye opener when I failed to achieve the required score. I needed a minimum of 7 in each module ..and overall 7.5. 1. Starting from the scratch. Yes! No matter on what Level you are, start with the basic grammar (I loved Simon ielts and IELTS buddy grammar section). 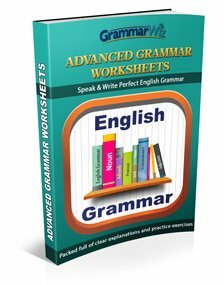 Go through the different sentences and their types: Simple / Complex. Punctuation. You have no idea how important this little comma is, use of articles. 2. Focus more on task 2!! The worst mistake I did was spending so much time on task 1. I never took the criteria seriously. TASK 2 carries twice as many marks. So, focus on it. If your task 2 went well, trust me it's better! You just have to expand the idea. Stick to one concept per idea and expand it. Yes literally. Please go through the columns, studies/surveys and just make any examples up. For instance: My task 2 was about the companies and employees / customers!! Make surveys up. That there was blah blah increase shown or according to UNICEF, there will be 33 percent increase in obesity by 2020 or blah blah (google some study; you will understand what I'm trying to say). Read the first sentence and keep asking yourself, am I linking it up with the previous one? Make sure you keep repeating it. Only write it down if you are 100 percent sure that it links with the whole topic. Keep reading the question and ask yourself - Am I being relevant? 8. 5 -10 mins Plan. Rough plan about what to write. List of a similar / related vocabulary. I even wrote the linking words and whatever fancy words I could remember. I just had to use them. 9. Grammar - Be Strategic! i.e. make sure you have at least one sentence starting with '-ing', one 'respectively' sentence, one with the relative clause, dependent or independent. A few simple sentences, and a few complex ones. One sentence starting with an 'if' . 10. Last but not the least , get yourself a study partner. Discuss it with her or him :) go through the notes together. IELTS is dull :@ . Be confident, make things up. Watch seasons, movies or whatever you want. Familiarise yourself with how a native would speak and answer. Please don't memorise the answers. They won't judge you. Give your opinion. Again get a foreign partner so you both can talk to each other and communicate ?? Usually the first and last line technique works for some people but I always ended up reading it all. I usually listen to the narrator and try to write down the points whilst listening. It is a bit tricky but it does help. It helps you recall the whole thing. I know it's not that easy. Helped me though. I did read Ryan's band 9 essays too! Thanks for the tips and well done for getting the score you needed. IELTS buddy! 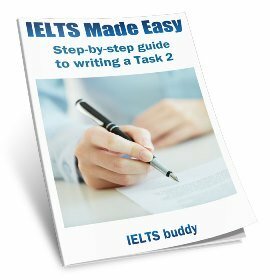 I owe it to you..my first step and that made it possible..I recommend it to everyone who is studying for IELTS .. Thanks a lot for some useful tips. All the tips were very useful. Thanks for your great support. Thank you for your guidance on IELTS coaching and support. Thank you so much for the tips, so helpful. Thanks for the tips, it's incredible. Hope I will get more of your tips. Your site, direction, proposals, and recommendations are absolutely valuable, and a terrific course of action in the IELTS PREP. Many thanks to all involved. Thanks a lot for the tips. They were really helpful. Thanks a lot for giving precious suggestions. Really effective for an IELTS candidate. Thanks for the advice. Well done. Thank you for such a precise and concise idea of task 2 writing. Anyways i will try the best to get the good result soon. Thanks IELTS buddy, you've really been of help to me. Your tips are really helping me practice for my exams. Thanks a lot. this site encouraged me to get a higher score in my next ielts exam. Simple and well-organized. Thanks! 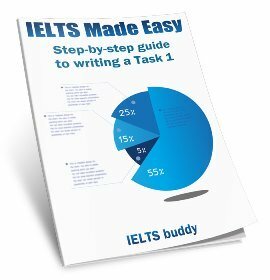 I am studying for my first IELTS test, and after reading your words, I can direct my studies to what is needed. I just took the IELTS academic module test on the 3rd of november and I think I did well. I just wanted to thank you for everything you post and your lessons were very helpful. You are doing a great job and every single user of your website should be thankful. Keep improving your website you are on the right path. Thanks for the feedback and glad to hear the IELTS Lessons helped. Well done, thanks for the tips. 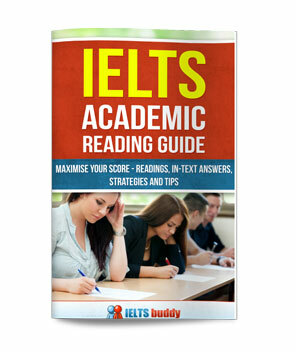 I will be having my ielts exam coming march and I'm suffering in the reading part. My score never exceeds 25 points. I really wish I could make it 30, I'm practicing on a daily basis and hopefully I can make it by then rather than that I'm good in the other sections.